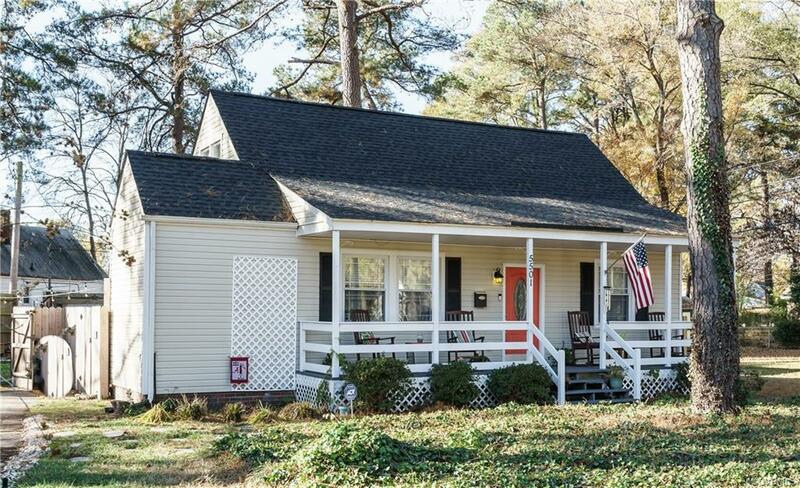 A country front porch welcomes you to this charmng renovated cape with many new improvements! The first floor has nice new and refinished hardwoods throughout! You'll find a chef's kitchen with stainless appliances, new quartz countertops, sink and dining area. The Living Room with ceiling fan is the perfect space to relax. A 1st floor master bedroom also has hardwood floors, a ceiling fan, & closet system. An office /BR on the 1st floor boasts cabinets, stone counter/desk with new shelving. Downstairs also find a spacious laundry room/mud room with shelving for extra storage. The upstairs has a large open loft/rec room with plenty of light, joined by a 3rd spacious bedroom! New baseboard heaters were just installed. The backyard is an outdoor oasis, newer deck and patio areas are surrounded by a privacy fence 6-8 ft tall. Also an 8x10 shed allows for storage of tools, lawnmowers, etc & beautiful landscaping. A new roof this fall, new HVAC was installed including removal of old system, crawlspace has new sump pump, vapor barrier & drains. Located close to all the major highways, Forest Hill Park, & plenty of great area restaurants & shopping.